Significant innovations in the treatment of patients with multiple sclerosis (MS) have primarily addressed the frequency of flare-ups in relapsing-remitting MS (RRMS). Many advances have been made in this area, and the medical community may be on the verge of a serious discussion of what constitutes a truly effective MS treatment. Certainly, it is important to further delay MS flare-ups and more effectively treat RRMS symptoms. However, great strides in reducing or preventing MS-related disability and providing neuroprotection have been elusive. Many unmet needs are still voiced by patients with MS, clinicians, and caregivers. Current information on the need for progress in various areas is reviewed in this article, including psychosocial care, treatments for progressive MS, biomarker identification, functional outcome measures, individualization of treatment, reducing side effects of medications, and improving medication adherence. Pharmaceutical care no longer consists solely of first-generation agents (eg, glatiramer acetate, interferon [IFN] beta-1a and beta-1b). Moreover, the medical community’s focus is moving from preventing relapse and reducing its frequency to investigating concepts that minimize MS-related disability. With several new treatments on the horizon, it appears that providers as well as payers are ready to tackle a critical question: What constitutes a truly effective medication MS management? To answer this question, the term “truly effective” should be examined, considering the outcome expectations of current medications and the ongoing challenges that await patients, providers, and caregivers. This article will review the unmet needs of patients with MS and their providers. 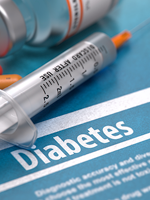 Improving adherence to current medications. Relative to the general US population, the median life span of patients with MS is 6 years shorter.8 Unfortunately, it is not known whether neuroprotection might, as a result of decreased neuronal injury and resultant avoidance of disability, extend life expectancy while improving quality of life. Strober and colleagues9 noted that nearly four-fifths of adults with MS were no longer employed as early as 5 years postdiagnosis, most commonly the result of disability. Based on the typical age range at diagnosis, it is expected that patients will live with the disease for 30 or 40 years. This is clearly a major concern, particularly as patients progress through different stages of disability, including poor mobility and complete dependence on family members or other caregivers for activities of daily living10,11 (Figure 1). MS-related disability can be categorized as physical or psychological (including cognitive). Even though the latter is cited as a huge unmet need by clinicians, researchers, and caregivers (discussed below), particularly because the numerous physical impairments impact mental health as the disease progresses, psychological disability is not being addressed comprehensively by biopharmaceutical manufacturers. Up to one-half of patients who receive disease-modifying therapy for MS do not experience any improvement in mobility.18 In addition to reduced mobility, which is the most common and obvious physical impairment in MS, other problems that occur as the disease progresses include dysphagia and defects in speech and vision; these contribute to worsening scores on the Expanded Disability Status Scale (EDSS), the major tool used to assess clinical status. Currently available medications have only slight to moderate effects in averting the progression of disability (Figure 2). According to a study from Ireland published in 2015, patients considered physiotherapy their greatest unmet need,19 likely due to the prevalent muscle stiffness and spasms experienced by many patients with advanced disease. Patients who experience systemic MS exacerbations have limited choices to help alleviate the attacks. 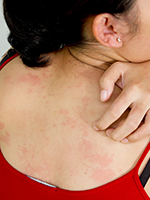 The principal acute symptoms include muscle stiffness or spasms, general fatigue, depression, and organ problems (eg, bladder control, vestibular dysfunction).22 The effectiveness of symptomatic treatment is variable.23 In most cases, high-dose steroids are administered to blunt the symptoms. For those who need additional treatment (<10% of patients with refractory symptoms), plasmapheresis may be useful.23 Otherwise, treatment is focused on targeting the specific symptoms of the systems affected. Also hampering the effort to establish suitable biomarkers for MS risk, diagnosis, and progression is the lack of understanding of the etiology of this disease.7 Until such understanding occurs, clinicians may be limited to treating MS rather than preventing it. Although a biomarker (antibody presence/absence) exists for determining whether patients taking natalizu­mab will be at risk for PML, there is no available biomarker for predicting whether MS will respond to this agent. Another unmet need is rapid prediction of whether a particular drug, which may be an expensive specialty product, will produce a response. Therapeutic trials of MS drugs may last 6 months or more.26 This contributes to high costs as well as delays in finding optimal treatment for an individual patient, potentially leading to additional disability and relapse in the interim. Because MS affects several areas of physical and neurologic function, no single measure (such as walking distance in a specified time) is adequate to assess symptomatic improvement or deterioration. 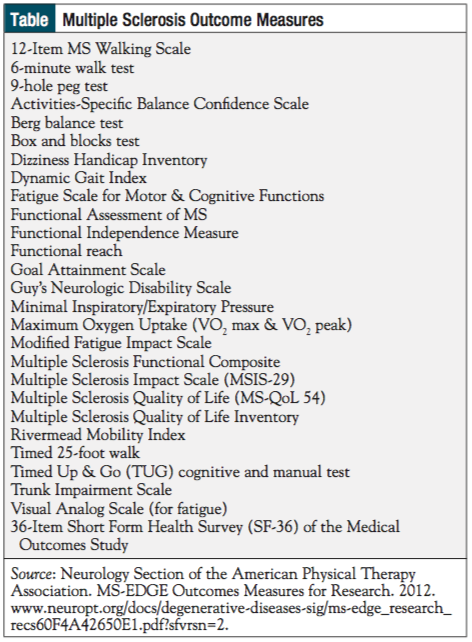 A task force of neurologic physical therapists evaluated 63 possible outcome measures covering body structure and function, activity, and participation, and recommended that 27 outcome measures be used for research (Table).32 It was concluded that these measures have good psychometric properties and good clinical utility. The disease-modifying therapies for MS that have been approved for treatment include the older first­generation agents (injectable IFN-beta, glatiramer acetate), oral drugs (dalfampridine, dimethyl fumarate, fingolimod, teriflunomide), monoclonal antibodies (alemtuzumab, natalizumab), and an immunosuppressive agent (mitoxantrone). Despite the attention afforded MS in recent years, many unmet needs remain in terms of therapeutics, disability avoidance, and outcome measures. More progress is needed not only in basic science and genetic and other factors, but in understanding patients’ priorities, which may improve (and possibly extend) patients’ lives, optimizing their ability to be productive. Further attention also must be given to managing the costs associated with treatment. Mr Mehr and Ms Zimmerman have no conflicts of interest to report. Mr Mehr is President, SM Health Communications, Newtown, PA; Ms Zimmerman is President, RxDirections, Bucyrus, KS. 1. National Multiple Sclerosis Society. Who gets MS? 2015. www.nationalmssociety.org/What-is-MS/Who-Gets-MS. Accessed September 17, 2015. 2. National Multiple Sclerosis Society. Estimating the prevalence of MS. 2015. www.nationalmssociety.org/About-the-Society/MS-Prevalence. Accessed September 17, 2015. 3. Markowitz CE. The current landscape and unmet needs in multiple sclerosis. Am J Manag Care. 2010;16:S211-S218. 4. Hirschler B. Roche gets jump on rivals in race for progressive multiple sclerosis treatment. September 28, 2015. www.reuters.com/article/2015/09/28/us-roche-multiple-sclerosis-rivals-idUSKCN0RS1M720150928. Accessed September 28, 2015. 5. Silva P. Could Genentech’s ocrelizumab become the first effective primary progressive MS therapy? Multiple Sclerosis News Today. September 29, 2015. http://multiplesclerosisnewstoday.com/2015/09/29/genentechs-ocrelizumab-­become-first-effective-primary-progressive-ms-therapy/. Accessed September 29, 2015. 6. Katz Sand IB, Krieger S. Emerging strategies for the treatment of multiple sclerosis. Future Neurol. 2012;7:193-207. 7. Katsavos S, Anagnostouli M. Biomarkers in multiple sclerosis: an up-to-date overview. Mult Scler Int. 2013;2013:340508. 8. Kaufman DW, Reshef S, Golub HL, et al. Survival in commercially insured multiple sclerosis patients and comparator subjects in the U.S. Mult Scler Relat Disord. 2014;3:364-371. 9. Strober LB, Christodoulou C, Benedict RH, et al. Unemployment in multiple sclerosis: the contribution of personality and disease. Mult Scler. 2012;18:647-653. 10. Anderson SS, Philbrick AM. Improving multiple sclerosis care: an analysis of the necessity for medication therapy management services among the patient population. J Manag Care Spec Pharm. 2014;20:254-261. 11. Bandari DS, Sternaman D, Chan T, et al. Evaluating risks, costs, and benefits of new and emerging therapies to optimize outcomes in multiple sclerosis. J Manag Care Pharm. 2012;18:S1-S17. 12. Senders A, Sando K, Wahbeh H, et al. Managing psychological stress in the multiple sclerosis medical visit: patient perspectives and unmet needs. J Health Psychol. 2014 Dec 19. Epub ahead of print. 13. Ponzio M, Tacchino A, Zaratin P, et al. Unmet care needs of people with a neurological chronic disease: a cross-sectional study in Italy on multiple sclerosis. Eur J Public Health. 2015;25:775-780. 14. Minden SL, Ding L, Cleary PD, et al. Improving the quality of mental health care in multiple sclerosis. J Neurol Sci. 2013;335:42-47. 15. Golla H, Mammeas S, Galushko M, et al. Unmet needs of caregivers of severely affected multiple sclerosis patients: a qualitative study. Palliat Support Care. 2015:1-9. 16. National Multiple Sclerosis Society. Cognitive changes. 2015. www.nationalmssociety.org/Symptoms-Diagnosis/MS-Symptoms/Cognitive-Changes. Accessed September 24, 2015. 17. Grazioli E, Yeh AE, Benedict RHB, et al. Cognitive dysfunction in MS: bridging the gap between neurocognitive deficits, neuropsychological batteries and MRI. Future Neurol. 2008;3:49-59. 18. Berger JR. Functional improvement and symptom management in multiple sclerosis: clinical efficacy of current therapies. Am J Manag Care. 2011;17(suppl 5):S146-S153. 19. Lonergan R, Kinsella K, Fitzpatrick P, et al. Unmet needs of multiple sclerosis patients in the community. Mult Scler Relat Disord. 2015;4:144-150. 20. Heesen C, Böhm J, Reich C, et al. Patient perception of bodily functions in multiple sclerosis: gait and visual function are the most valuable. Mult Scler. 2008;14:988-991. 21. Galetta SL, Villoslada P, Levin N, et al. Acute optic neuritis: unmet clinical needs and model for new therapies. Neurol Neuroimmunol Neuroinflamm. 2015;2:e135. 22. National Multiple Sclerosis Society. MS symptoms. 2015. www.nationalmssociety.org/Symptoms-Diagnosis/MS-Symptoms. Accessed October 23, 2015. 23. National Multiple Sclerosis Society. Medications. www.nationalmssociety.org/Treating-MS/Medications#section-2. Accessed October 23, 2015. 24. Kappos L, Moeri D, Radue EW, et al. Predictive value of gadolinium­enhanced magnetic resonance imaging for relapse rate and changes in disability or impairment in multiple sclerosis: a meta-analysis. Gadolinium MRI Meta-­analysis Group. Lancet. 1999;353:964-969. 25. Foley JF, Zerkowski K, Nair KV. Evidence for long-term use of intramuscular interferon beta-1a: an overview of relapse, disability, and MRI data from selected clinical trials. J Manag Care Pharm. 2013;19(suppl A):S4-S15. 26. Wilner AN, Teunissen CE. MS biomarkers in the clinic: around the corner? December 20, 2011. www.medscape.com/viewarticle/755699. Accessed September 10, 2015. 27. US Food and Drug Administration. FDA permits marketing of first test for risk of rare brain infection in some people treated with Tysabri. January 20, 2012. www.fda.gov/NewsEvents/Newsroom/PressAnnouncements/ucm288471.htm. Accessed October 23, 2015. 28. Jeffery DR. 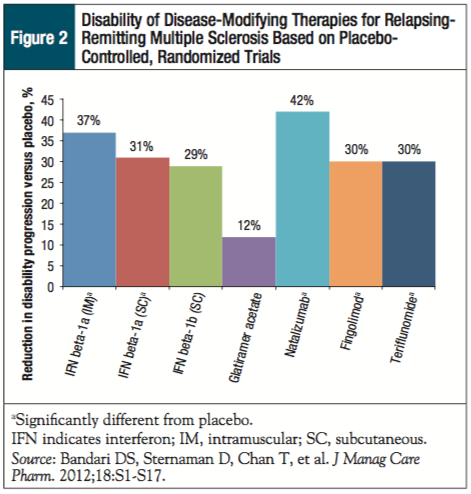 Recent advances in treating multiple sclerosis: efficacy, risks and place in therapy. Ther Adv Chronic Dis. 2013;4:45-51. 29. Bozic C, Richman S, Plavina T, et al. Anti-John Cunningham virus antibody prevalence in multiple sclerosis patients: baseline results of STRATIFY-1. Ann Neurol. 2011;70:742-750. 30. Owens GM, Olvey EL, Skrepnek GH, Pill MW. Perspectives for managed care organizations on the burden of multiple sclerosis and the cost-benefits of disease-modifying therapies. J Manag Care Pharm. 2013;19(suppl A):S41-S53. 31. Tanasescu R, Ionete C, Chou IJ, Constantinescu CS. Advances in the treatment of relapsing-remitting multiple sclerosis. Biomed J. 2014;37:41-49. 32. MS-EDGE Outcomes Measures for Research. Neurology Section of the American Physical Therapy Association 2012. www.neuropt.org/docs/degenerative-diseases-sig/ms-edge_research_recs60F4A42650E1.pdf?sfvrsn=2. Accessed September 28, 2015. 33. Bermel R, Waldman A, Mowry EM. Outcome measures in multiple sclerosis. Mult Scler Int. 2014;2014:439375. 34. Cohen JA, Reingold SC, Polman CH, Wolinsky JS; International Advisory Committee on Clinical Trials in Multiple Sclerosis. Disability outcome measures in multiple sclerosis clinical trials: current status and future prospects. Lancet Neurol. 2012;11:467-476. 35. Sanofi. Lemtrada prescribing information. November 2014. http://products.sanofi.us/lemtrada/lemtrada.pdf. Accessed September 30, 2015. 36. Biogen Idec. Tecfidera prescribing information. April 2015. www.tecfidera.com/pdfs/full-prescribing-info.pdf. Accessed September 30, 2015. 37. Noyes K, Weinstock-Guttman B. 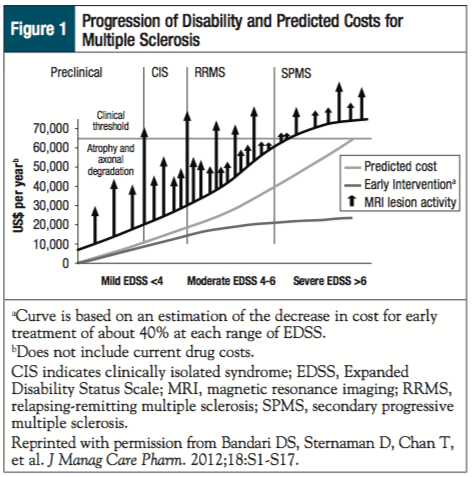 Impact of diagnosis and early treatment on the course of multiple sclerosis. Am J Manag Care. 2013;19(suppl):S321-S331. 38. Tramacere I, Del Giovane C, Salanti G, et al. Immunomodulators and immunosuppressants for relapsing-remitting multiple sclerosis: a network meta­analysis. Cochrane Database Syst Rev. 2015;9:CD011381. 39. Weinstock-Guttman B. An update on new and emerging therapies for relapsing-remitting multiple sclerosis. Am J Manag Care. 2013;19:S343-S354. 40. 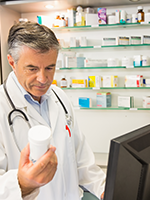 Visaria J, Henderson R, Glave Frazee S. Specialty pharmacy improves adherence to imatinib. Am J Pharm Benefits. 2013;5(special issue):SP33-SP39.